You Me At Six is set to hit North America on the Back Again Tour 2019 in support of their triumphant sixth studio album called VI released on October 5th via Underdog Records / AWAL. VI debuted at Number 6 on the UK album chart, marking the band’s 5th UK Top 10 Album. 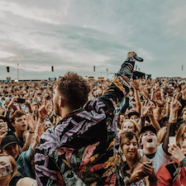 You Me At Six – comprised of vocalist Josh Franceschi, guitarists Max Helyer and Chris Miller, bassist Matt Barnes, and drummer Dan Flint – will ignite stages across the U.S. and Canada kicking off in Boston at Brighton Music Hall on February 22, 2019. Tickets for the Back Again Tour 2019 go on sale Friday, November 2nd at 10am ET via: https://youmeatsix.lnk.to/live.